We have not found any names of companies or people in this document that match names in our corporate records. Constructive fraud in the sale and purchase of the State Lease for a residential house in Madang. The transfer of the lease to a Frank and Marina Maru was quashed and the property restored to its rightful owners, the Lutheran Church. in trust for another corporation. interest in property to another corporation. proceedings. The proceedings were not summarily dismissed. circumstances that were peculiar, irregular and suspicious. Section 373 of the Companies Act when the company became defunct. State Lease to the plaintiff. sought by the plaintiff was refused. This was an application for declarations and orders regarding a State Lease. transfer registered on 23 August 2017. Church of Papua New Guinea Act 1992. State Lease over the property. transferred the State Lease to Mr and Mrs Maru. accordance with the constructive trust in favour of the Church. required to transfer it to the Church. primary relief it seeks is an order that the State Lease be transferred to it. defendant’s counsel, Mr Wadau, made submissions at the trial. 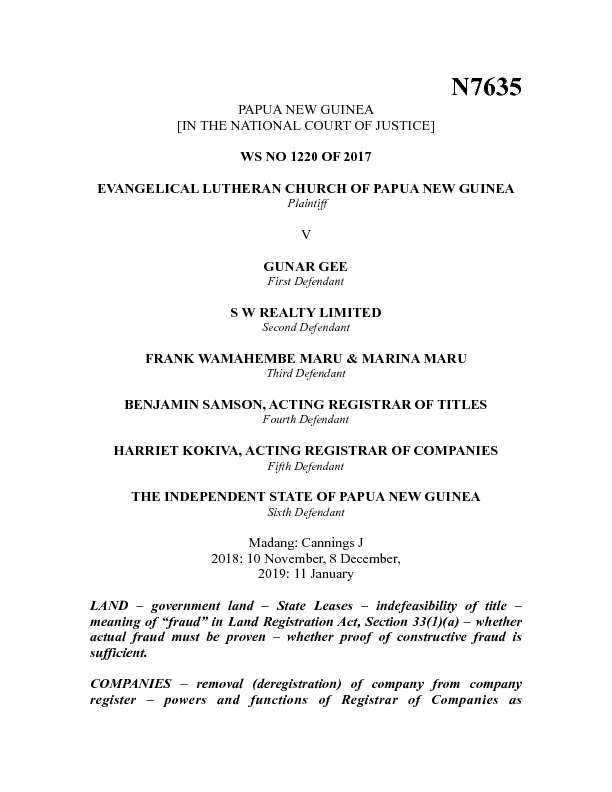 of Lutheran Church (Madang) Ltd, which is an entirely separate entity. 1. Should the proceedings be summarily dismissed? constructive trust for the Church? Lutheran Church (Madang) Ltd became defunct? steps regarding the State Lease? 6. What declarations and orders should the Court make? PROPRIETORS IN A CASE OF FRAUD? (2011) SC1120 and Kol Toki v Moeka Morea (2016) SC1588. Supreme Court has indicated that proof of actual fraud is necessary. outdated and inappropriate to the circumstances of Papua New Guinea. must be determined in the affirmative for the following reasons. 33(1)(a) of the Land Registration Act. Madang Town, Madang District, held it in constructive trust for the Church. Companies Act, in particular Sub-section (1). of the company from the register. (b) apply to the Court for the appointment of a new trustee. interest or any part of it as he thinks fit. kept by a receiver or liquidator under this Act. (d) make any ancillary orders. the date on which the moneys were paid into the account. 373(4) to sell or otherwise dispose of that interest as he thinks fit. but not if that estate or interest is “merely held in trust”. purport to sell the property to the Institute was wrong. Church (Madang) Ltd became defunct. duly executed the instrument or document. vest in the Registrar because of section 373(2). instruments to give effect to the transfer. effecting the transfer of the State Lease to the Church. ordered (so as to give effect to the constructive trust) to effect that transfer. step of nullifying the title of the registered proprietors, Mr and Mrs Maru. defect in title (arising from the fact that the vendor was a defunct company). they acted genuinely or were innocent participants in the fraud. enforce) it is appropriate that the parties bear their own costs. or about 23 August 2017 is null and void and is quashed. Section 34, Allotment 17, Madang Town, Madang District. Allotment 17, Madang Town, Madang District to the plaintiff. proceedings, the parties shall bear their own costs of the proceedings.